23 Nov 2018 was a great day. 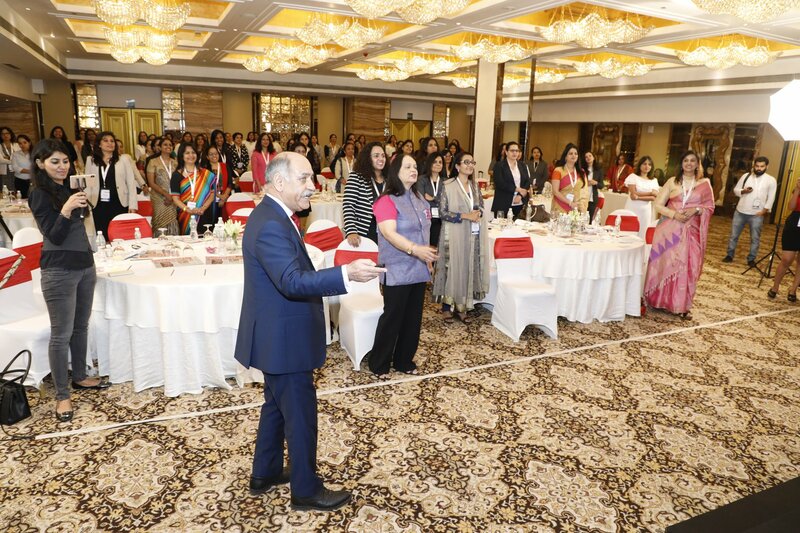 This was Transformance Forums’ 3rd Future Women Leaders Summit and Awards at St Regis, Mumbai. Kudos to the Transformance Forums team headed by a highly competent organizer, Mr Abidali Dossa, who put up a great show and created the right ambience that added to the sanctity of the subject. Lady without a tiara, the Chairperson, Ms Aparna Sharma, kept the audience enthralled with her wit. She did a commendable job in weaving the speakers in an intellectual necklace of wisdom. Wow, she added humour and spice to anything whether it was what she said, sang or acted, and electrified the environment. When I walked out in the evening I was happy to observe a lot of things, and not too happy with a few. Let me summarise my feelings. 1. Women are contributing a lot to the nation building effort. The numbers are not large, but the trend shows they are growing. We need to give them both encouragement and space with lot of support as they are capable of doing much more and many of them are still unable to come to the forefront. 2. I could clearly see the confidence levels that are rising. With more support and encouragement they can easily rise steeper. 3. Women are multi-taskers. They said it. Though there is a growing belief that the human brain is not wired to multi task. Yet, managing the home-front and the office is really an admirable skill, whatever name we give to it. 4. There is an encouraging trend to see more and more women picking up the courage to enter the once dreaded arena of entrepreneurship. 5. In their exuberance and excitement, I heard some of them talking of competing with men. Some were heard saying ‘we are better than men.’ To me it sounded something like say ‘blue is better than green,’ or ‘apples are better than oranges.’ In the human ‘race’ is the word race being misinterpreted. From the times of Adam and Eve I thought the message was ‘happy co-existence.’ Who said we are here to prove who is better than who? Who is the judge? I think we can’t do without each other and we need to co-exist in perfect harmony and existence. 6. In the end I heard a statement. Though I could appreciate the ‘spirit’ It was both comical and painful. “We will change the world from a male dominated world into a female dominated world.” My personal opinion. If Genie was to grant you that wish, and if you think the male dominated world is bad, let me tell you, the female dominated world could be as bad or maybe even worse. 7. Leaders today, whether men or women, need to be prepared for the D-VUCA-D (Diverse, Volatile, Uncertain, Complex, Ambiguous and Digital) world. We have moved from the Industrial age, to the information age and now into the Imagination age. The competitive, rapidly changing corporate environment demands ‘on the feet thinking’ and foresight. Capability to operate ahead of the predictability world. There is place on the top for leaders who qualify in categories like thought-leaders, neuro-leaders, and digital-leaders. 8. Leaders today need mentoring and coaching. Just like the content of a bottle cannot read its label, a leader cannot monitor his own progress and growth. You need a coach / mentor – someone who is experienced and competent, who you trust and who is prepared to consider your success better than his / her own. After eight hours of listening to eight speakers and a panel and then see award winners walk up with confidence and poise on to the stage to achieve the awards, I left the hall with an amazing feeling. I concluded that my belief was strengthened. A belief that the women are playing a significant role in nation building and they must be given more opportunities and support. The mindset that keeps them at a position of disadvantage has to be eradicated so that we get the best talent work for the country, irrespective of the gender. Women have always played a vital role in the socioeconomic development of our nation and today they’re contributing more than ever. Fantastic! Feeling proud to be a woman, and after watching this awesome energetic session full of positivity and encouragement, I am spellbound. Also, I am grateful to Brigadier Sushil Bhasin sir,under whose guidance I duscovered my strengths and developed my hidden skills.